While there are no words for the devastation experienced by our community as a result of the Thomas Fire and subsequent mudslide, here at TechEase we’re both heartened by the ongoing relief efforts and proud to play our part by offering free data recovery to those affected. 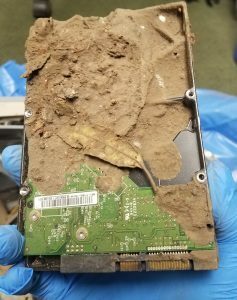 After La Casa de Maria lost their entire administrative building in the mudslide, they brought us six computers that they found buried under fifteen feet of mud and debris. We were able to recover 100% of the data from these computers, including important fundraising and customer database information that will make their rebuilding efforts that much easier. Two of the computers were even able to be repaired, saving this local non-profit the expense of buying new equipment! La Casa has been a sanctuary for the Santa Barbara community since 1955, offering retreats and programs to 10,000+ people a year. Their stated mission of promoting the common good of our communities “through art, education, health and healing” has become even more vital in these difficult times – may the recovered data bring them this much closer to continuing their incredible work. We’ll continue to offer free data recovery here and at MacMechanic for as long as necessary, so please spread the word to anyone who might benefit from this service.